creating potential for water leaks over time, is a significant influence. To reduce this risk, it’s best to keep the basic house design as simple as possible. Starting with the foundation, try to stay as close to a true rectangle as possible, avoiding projections in the footprint. Starting here, everything above the foundation then follows suit, you’ll have a simpler basic structural design, and a simpler roof design will follow. All of these efforts result in lowering the base bids for construction costs. The shape factor concept used in designing post-tension foundations (SF=Foundation Perimeterº2/Foundation Area)6 indicates that changes in direction or projections require foundation engineering and reinforcements that not only add cost to the foundation, but also increase the incidence of failures. Beyond concerns for the foundation itself, all deviations from a basic rectangular de- sign add complications to structural assemblies and roof designs that are not only costly to build but again have greater potential for leaks. Costs increase not only because of the additional materials required to provide structural support, but also from increased labor that adds time and costs to construction schedules, impacting interim financing and construction costs. And it’s not just the money—chopped-up architectural designs waste natural resources, as they take much more materials to build the same basic square footage. We also found a study that references shape factor in terms of the relationship between a building’s thermal envelope area and the volume of its conditioned space. 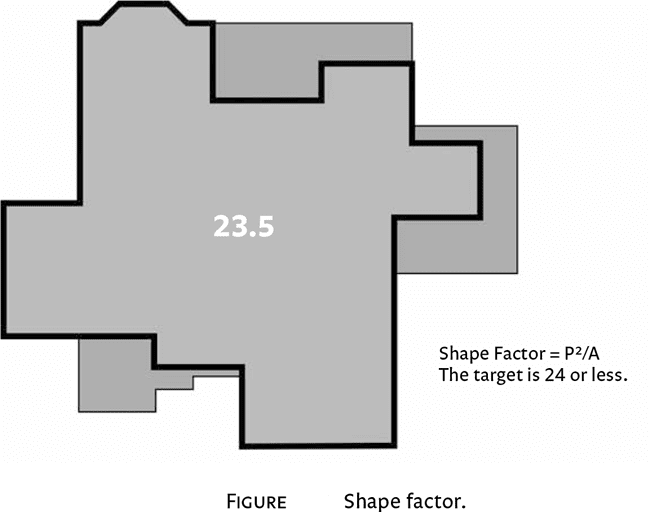 From this perspective, buildings with higher shape factors, i.e., a larger area of exposed thermal envelope, use more energy than those of the same area but a smaller shape factor. This was especially true in cold climates due to an increased area of heat loss, and had less to no impact in climates as they progressed along a continuum to warmer.